Dough nuts don’t seem like they would be especially difficult to make at home, just make up the dough and fry them in hot grease. Like making french fries. Oh, my mother used to make us french fries cooked in hot bacon grease, to die for!! Anyway, raised doughnuts (dough nuts, donuts) call for yeast in the dough and need to rise for about an hour, then rise again after they have been cut into dough nut shapes. If the reference to “potato yeast” confuses you, don’t worry you are not alone. In my research I learned that while potato dough nuts have been around for years, in the 30s or 40s, a pair of enterprising brothers in Utah coined the word “spudnut” to reference potato flour. 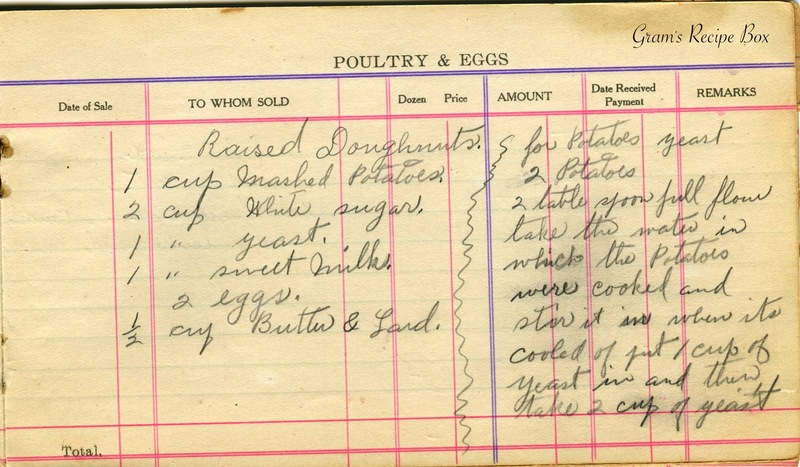 The potato flour would have been used the same as mashed potatoes in this recipe. Apparently there was a spudnut craze for quite a while, and there remain Spudnut Shops nationwide. As to the directions up there, I think it creates a type of starter, like for sourdough. Anyone have input here? The yeast here bothers me. I think there may be more to the recipe. Also what about the flour? Even with the potatoes, I think there needs to be flour – and this would make a very large number of donuts. Cooks knowledge also may be a factor. DO NOT TRY THIS RECIPE! I’ve actually BAKED doughnuts before when I was completely craving a doughnut, but trying to be a wee bit healthier. I used a basic cake doughnut recipe (probably from my mom’s 1960’s era breads cookbook) and just baked them instead of frying. They came out pretty decent–very much like a biscuit in looks, but exactly like a doughnut in taste. I’ve never made doughnuts involving yeast because when I want a doughnut, I don’t have the patience to wait for yeast to rise. I’m wondering if the author just assumed you’d add flour to make a dough, but a cup of yeast is insane! My thought is that in the original recipe she was copying it had 1 C yeast that was meant to be 1 CAKE yeast (equivalent to 1 modern packet of yeast) and just used ditto marks without even thinking.